May 11th we reopen doors for another huge season! We explode back into action for the 2019 season with an incredible line-up to kick off the summer season in style! We can’t wait to celebrate 45 years of music, memories and making history on our dance floors. For this special occasion we have invited some of these amazing artists to join us! LUCIANO - This DJ/Producer needs little introduction, a headliner for numerous festivals around the globe who responsible for some of the most electrifying parties in recent years – he’s back with us for a special sunset mix for our opening party, you don’t want to miss this! THE MARTINEZ BROTHERS – Two of the most in demand artists in the music industry right now, the duo born and raised in the New York borough known as the Bronx will be bringing their own unique sound and style to our Opening Party! Expect fireworks! HECTOR COUTO – The Spanish DJ known for his unique production style resulting in a fresh compelling sound that always gets dance floors moving. Hector’s technique and creativity has gained him many accolades in recent years and we can’t wait for him to join us! MAR-T - A well-known name at Amnesia Ibiza and an artist known for his versatility will join us for the first day of the 2019 season, the owner and creator of Wow! Recordings will bring his unique style to grace our famous Terrace once again! CAAL – One of our own talented resident DJs, known for his infectious smile, energy and persona that he can easily transmit to any dance floor. His sets are filled with samples, loops, beats and other tricks to take the crowd on a musical journey for our Opening Party. 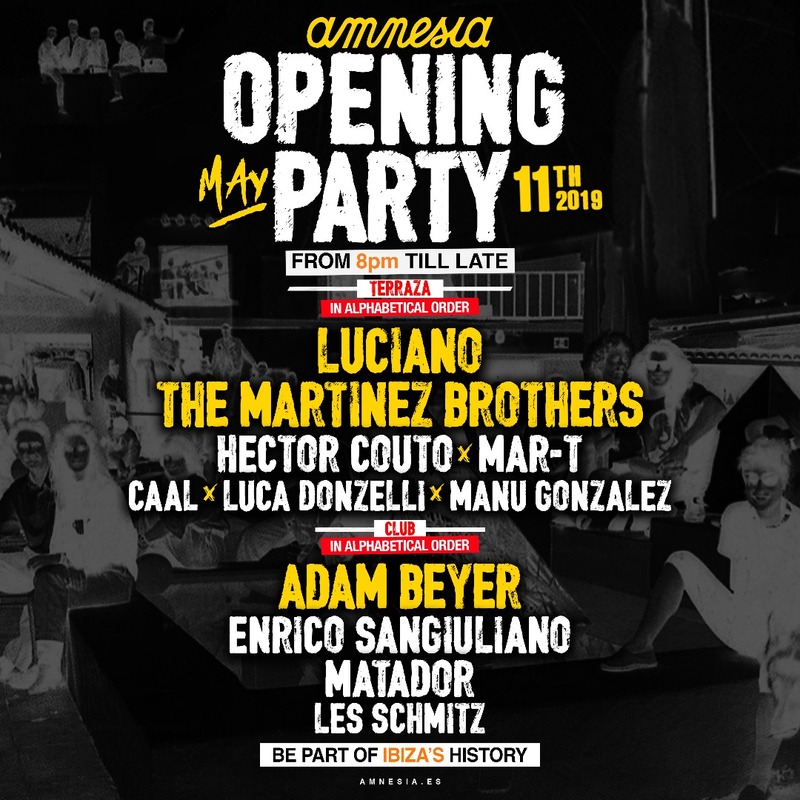 LUCA DONZELLI – The talented Italian is a stand out DJ/producer who is ever present in line-ups around the world, Luca represents what Amnesia Ibiza stands for with his unique sound that is also present in many of our Amnesia Worldwide parties. We welcome him back on May 11th. MANU GONZALEZ - One of the rare breeds of home grown talent to come from Ibiza, born in 1990 the DJ is beginning to make an impact on the Balearic electronic scene, from the age of 15 he has been developing his skills and sound and we can’t wait for him to join us on the Terrace! ADAM BEYER – Techno Heavyweight and founder of the Drumcode Record label is no stranger to the DJ booth at Amnesia Ibiza, joining us for numerous parties over the years we are delighted to have him back in the Club Room to kick off the season in a remarkable way! ENRICO SANGIULIANO – Making his debut with us on this special day, the Italian producer has been one of the fastest growing names in the Techno scene in recent years leading to support from around the globe and collaborations with some of the industries finest. Welcome Enrico! MATADOR – The Dublin-born, Berlin based techno DJ/Producer is set to deliver one of his mind-blowing sets to the Ibiza clubbing community on May 11th. We can’t wait for the revolutionary artist to join us! Expect a packed crowd for this! LES SCHMITZ - Another one of our legendary residents who will be representing Amnesia in the booth of the Club Room on May 11th. A name that without a doubt knows how to get the crowd moving! Get your ticket securely and at the best price here.